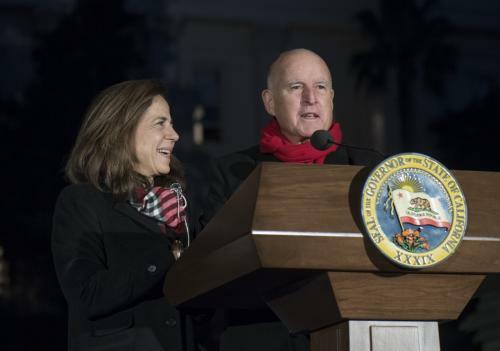 Sacramento, California - Governor Edmund G. Brown Jr. and First Lady Anne Gust Brown hosted the 87th Annual Capitol Christmas Tree Lighting Ceremony this evening on the West Steps of the State Capitol. “During this very special and holy season, we remember our friends and our blessings but we also take into account those who have suffered losses, particularly those who have lost so many loved ones in the fires in California, our firefighters and the other first responders,” said Governor Brown. Governor Brown and First Lady with Kiran Dong at the Capitol Christmas Tree Lighting Ceremony. 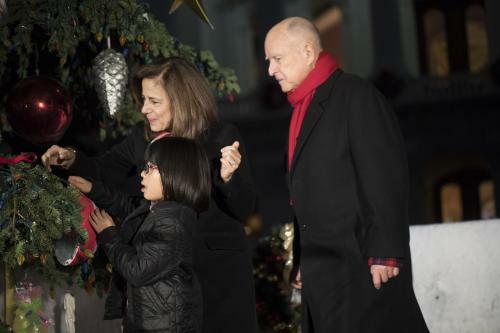 This year, the Governor and First Lady lit the Capitol Christmas tree with 7-year-old Kiran Dong of Valencia, who was born with Prader-Willi Syndrome and receives services from the North Los Angeles County Regional Center. The tree is illuminated by approximately 10,000 ultra-low wattage LED lights and is decorated with more than 900 hand-crafted ornaments made by children and adults with developmental disabilities who receive services and support from the state’s developmental centers and 21 nonprofit regional centers. 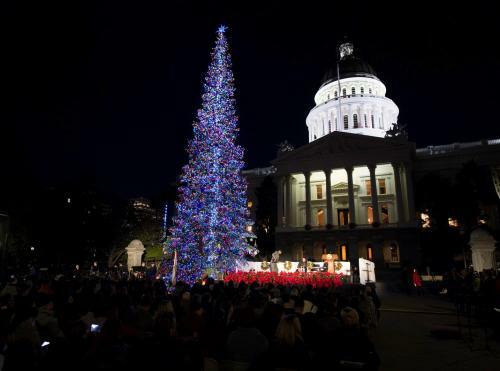 Governor Brown delivers remarks at Capitol Christmas Tree Lighting Ceremony. 87th Annual Capitol Christmas Tree Lighting Ceremony. Kitty O’Neal of KFBK Radio emceed the ceremony, which included feature performances by the California Army National Guard’s DET 1, 40th Infantry Division Band, Brass Quintet, the Governor’s Own; students from the Oakland Military Institute and Oakland School for the Arts; Harley White Jr. Trio; and St. Paul’s Baptist Church Choir.